Valentine’s Day is the day of lovers. Lovers share their feelings of love by gifting each other. Winni offers this Romantic Valentine Chocolate as a Valentine’s Day gift. Express your emotions for your loved ones with the sweetness of chocolates. 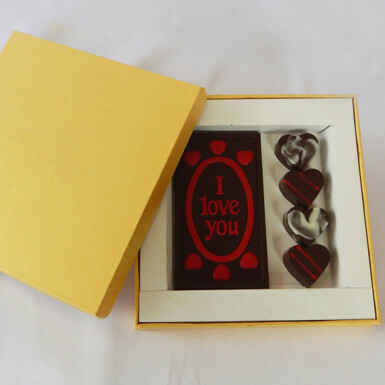 Love is described on the chocolate by the lovely wording of I Love You and little heart shaped chocolate set of 4 by its side. This is a loving box for your beloved ones. Erase all bitterness in your relationship and lighten & brighten your love. We are here to help you to make your relationship healthy & smooth. Place your order at Winni and get a lovely & delicious Romantic I Love You Valentine Chocolate. Winni.in.